That image of bacteria changed when the University of Colorado at Boulder researchers discovered that E. coli bacteria cells get excited when poked. And they send voltage out from sensing that touch — the same way our sense of touch relays messages to our brain via an electrical pathway. 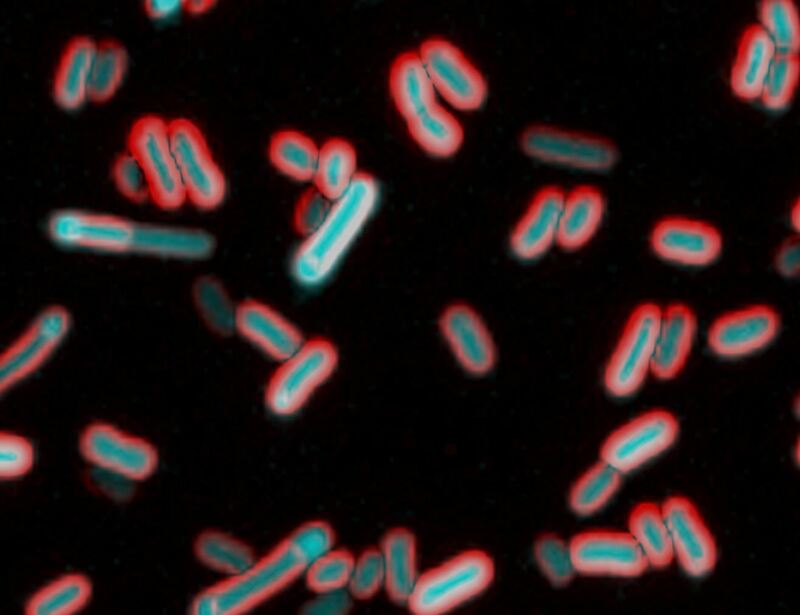 Senior author Joel Kralj, a researcher at BioFrontiers Institute, and his colleagues believe this is the first demonstration of electrical excitability in individual bacterial cells. Their study was published August 14 in PNAS. We know that E. coli responds to chemical signals. Studies have shown that they can detect and respond to chemicals, navigating toward "attractive" ones — like nutrients — or away from those it detects as a repellent. Cellular molecules called receptors lodged in the bacteria's outer membrane detect chemicals outside the cell, then tell it whether to either move closer or farther away from the source of chemicals. Bacteria also adapt to other environmental conditions like changes in temperature, pH, concentrations of ions such as sodium and calcium. Their reaction to these conditions involves changes to how genes function. Bacterial genes respond by increasing or decreasing the processes under their control to react to changes in their environment. Certain cells in vertebrates — including neurons, muscle cells, and B lymphocytes — communicate using the concept of electrical excitability. They can create a tiny electric current. When calcium, sodium, and other positively charged ions enter the cell, it changes the cell's voltage potential by creating a positive charge inside the cell relative to the outside, called voltage depolarization. Scientists can measure this voltage depolarization as an electrical current. In vertebrate nerve cells, close contact between neighboring cells allows the electrical signal to jump between cells using ions, and the cells use this signal as a form of communication. Since biofilms are bacteria in very close contact with one another, one bacteria could communicate the electrical pulse to another that way. But, scientists didn't know how bacteria could create an electrical signal. To help us understand how bacteria adjust their behavior during infection and biofilm development Kralj and his team investigated how bacteria sense and respond to mechanical cues in their environment. The research team hypothesized that E. coli may be electrically excitable — using voltage depolarization and calcium ion influx — as neurons and other excitable cells do. They devised a system to see if poking them as a means of mechanical stimulation could be a way to excite them. To conduct their investigations, the scientists genetically modified Escherichia coli to add a calcium sensor. It made the bacteria glow when calcium ions pulsed through it during depolarization. They adhered the modified E. coli to a sticky surface and observed what happened. The cells didn't glow if they were left alone, but when the scientists poked them with a pad, they reacted differently. The bacteria lit up, indicating that ions and electricity were moving around in the bacteria. Finding that bacteria can sense their surroundings and respond to mechanical stimulation sheds new light on bacterial activity during an infection. Other research has shown that bacteria in biofilms can communicate via electrical signals. Kralj thinks that mechanical forces trigger depolarization and calcium movement into cells that can cause them to be more pathogenic, allowing bacteria to use both mechanical and chemical cues to start an infection. "If we can block bacterial electrical activity, they may be less likely to infect, because now they don't know that they have landed on your soft, delicious gut cell," Kralj said. "We could cut their hands off so they can no longer feel." The researchers plan to elucidate the specific forces that trigger the mechanically induced changes in E. coli, and whether this signaling occurs in other bacteria. They also plan to study how bacteria's electric pulses play a role in the infection of human cells. If we could dampen these mechanical signals, that might represent a point of weakness we could exploit to treat bacterial infections.